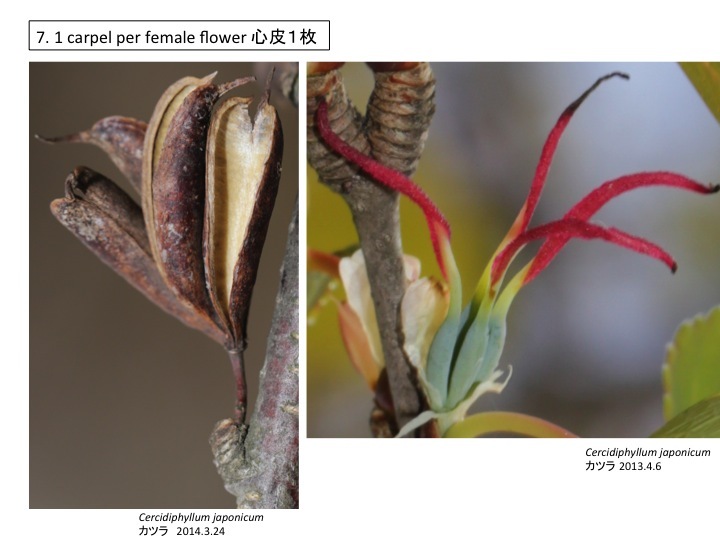 Two species in one genus in a family are distributed in Japan and China. 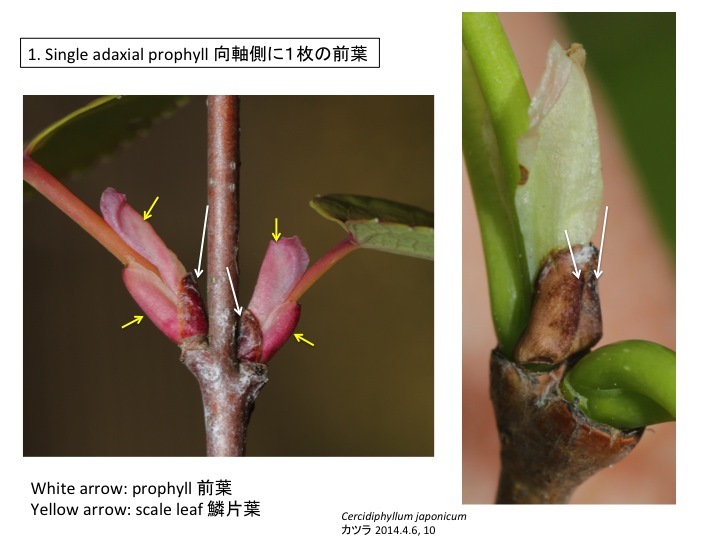 Prophylls are the first leaves formed in the axillary shoot. A pair of opposite leaves are usually formed in dicots, while a single leaf in monocots. Morphological diversity of prophylls are explained by fusion or reduction. 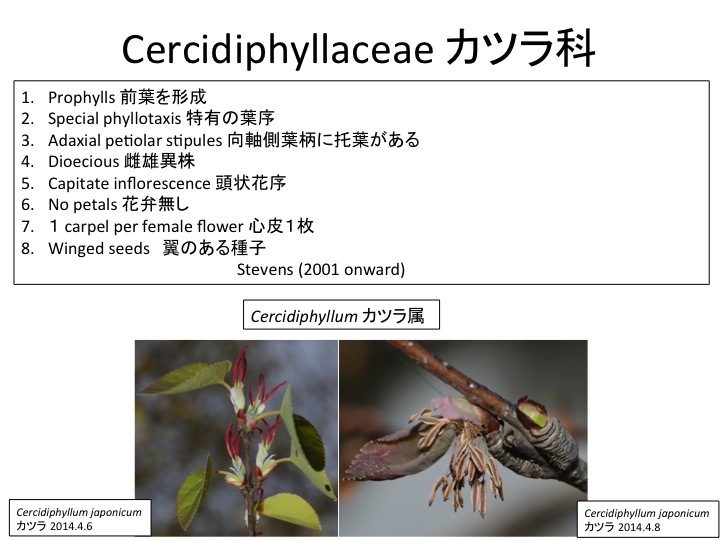 A prophyll of Cercidiphyllum japonicum has two main veins, suggesting the single prophyll is formed by a fusion of two prophylls (Kumazawa 1979). As the prophyll is formed at the initiation of an axillary shoot, the cotyledon is formed when a main shoot is initiated. There may be developmental constraint that the prophyll or cotyledon is necessary to form a leafy shoot. Prophylls are opposite, two scale leaves and one regular leaf are alternate, and subsequent regular leaves are opposite. How the change of phyllotaxis is regulated? Both long and short shoots of Cercidiphyllum japonicum are sympodial and a shoot of a next year is formed at the axil of a leaf of the previous year. 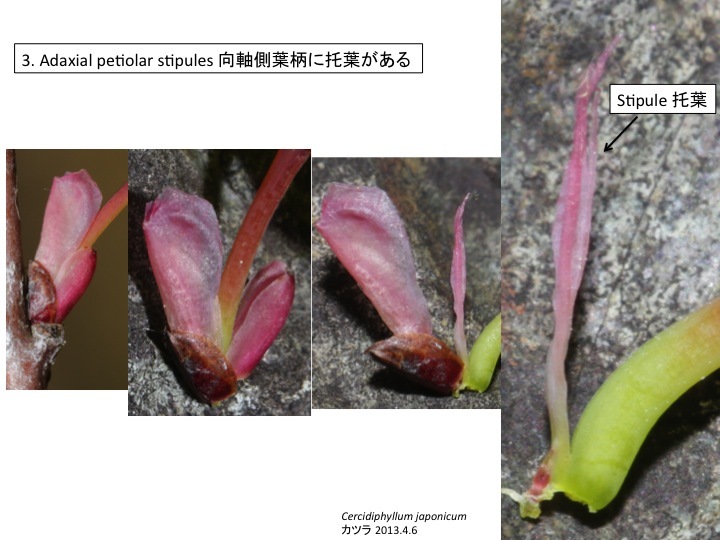 In the short shoot, primordia of opposite leaves are formed but do not grow, while those primordia grow in the long shoot (Kumazawa 1979). 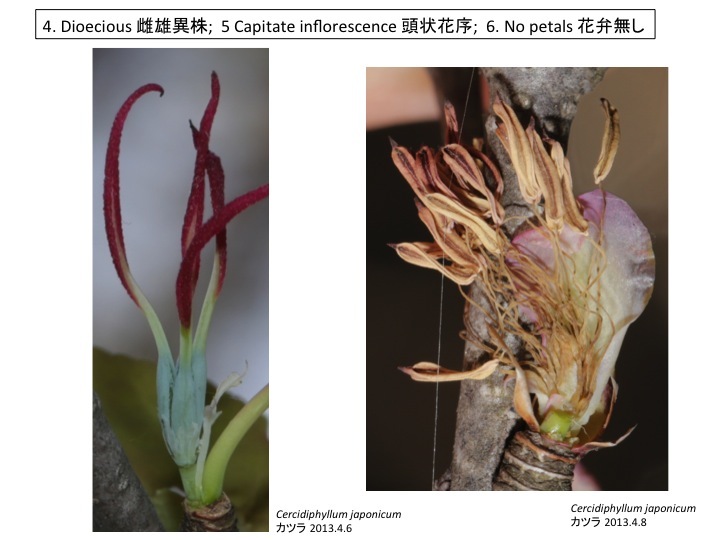 This difference is likely regulated by auxin (Titman and Wetmore 1955) but the involvement of strigolactone is unknown. 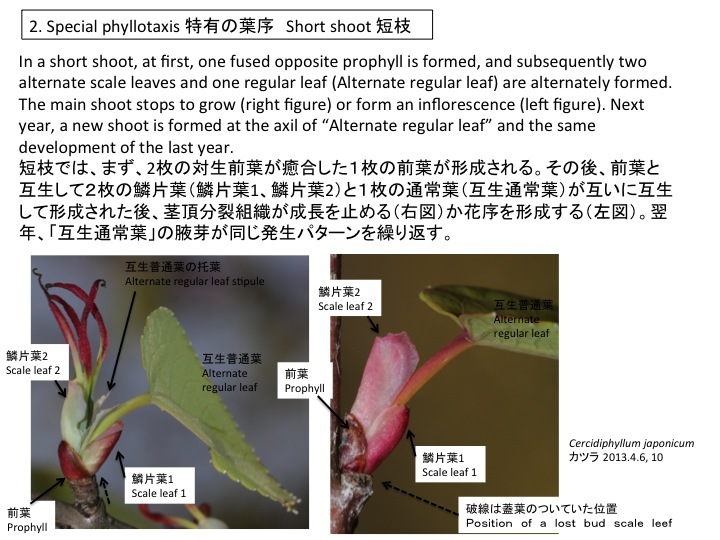 Similar auxin involvement between long and short shoot development is found in Ginkgo biloba （Gunckel and Wetmore 1946a, b, Gunckel and Thiman 1949, Gunckel et al. 1949). The same number of leaves are formed in a short shoot as that in a long shoot in Ginkgo biloba. One leaf is formed in Cercidiphyllum japonicum. Axillary meristems are dormant without a leaf in Arabidopsis thaliana. It is mechanistically interesting how different number of leaves in the short shoot is regulated. Gunckel, J.E. and Wetmore, R.H. (1946a) Studies of development in long shoots and short shoots of Ginkgo biloba L. I. The origin and pattern of development of the cortex, pith, and procambium. Amer. J. Bot. 33: 285-295. Gunckel, J.E. and Wetmore, R.H. (1946b) Studies of development in long shoots and short shoots of Ginkgo biloba L. II. Phyl- lotaxis and the organization of the primary vascular system; primary phloem and primary xylem. Amer. J. Bot. 33: 532-543. Gunckel, J.E. and Thimann, K.V. (1949) Studies of develop- ment in long shoots and short shoots of Ginkgo biloba L. III. Auxin production in shoot growth. Amer. J. Bot. 36: 145-151. Gunckel, J.E., Thimann, K.V. and Wetmore, R.H. (1949) Studies of development in long shoots and short shoots of Ginkgo biloba L. IV. 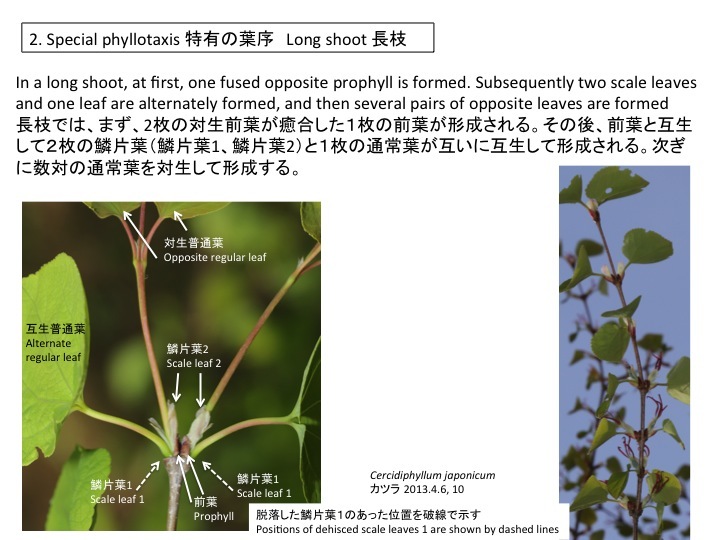 Growth habit, shoot expression and the mechanism of its control. Amer. J. Bot. 36: 309- 318. Titman, P.W. and Wetmore, R.H. (1955) The growth of long and short shoots in Cercidiphyllum. Amer. J. Bot. 42: 354-372.